Yummy flavors, easy, inexpensive... this recipe is a great one! I love spices and new options, especially when you go looking around and type in 'way to stretch ground beef'. It happens sometimes. You only have a little and you need it to go a bit further. This is a good way. First I always, always, cut up onions to help my beef. 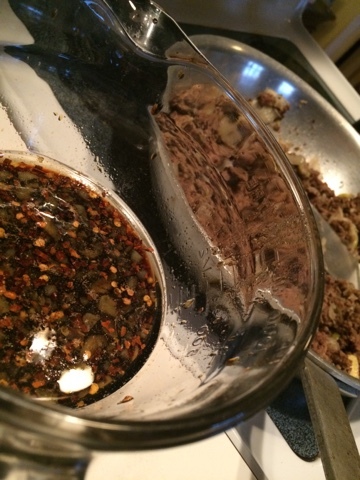 I cook them together so that the onions get soft and delicious in the beef. If I have any mushrooms, I toss them in chopped as well. Another way to get something substantial that helps it seem like there is more meat there. And if I still need more, and if I have it, I will chop other veggies fine. When I made this meal, I just kinda 'picked and chose' what we had available and what sounded like would work for us. We were just low on everything... so this is seriously low cost, low ingredient meal. Brown your ground beef with your onions and mushrooms or however you like to do it. While that is browning go ahead and get your rice cooked. red pepper flakes to your liking- I think I used a couple tsp. 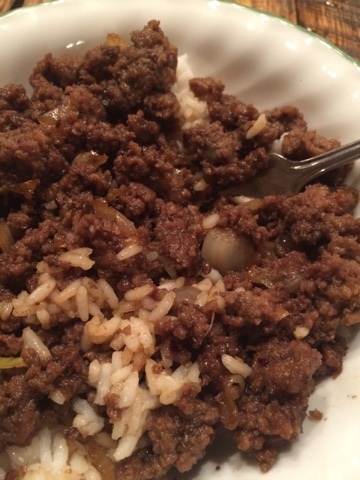 Once your beef and rice is ready, toss the sauce on the beef and mix. Get everything incorporated and hot and serve with a side of green beans or a salad! I'm not a food photographer... but this was GOOD!